The Meziere Remote Mount Mechanical Water Pump has been used on several unique projects as a way to allow custom accessory arrangements that would stand in the way of a typical block mounted water pump. It is typically mounted off to the side of the engine much like an alternator or air pump and is belt driven. 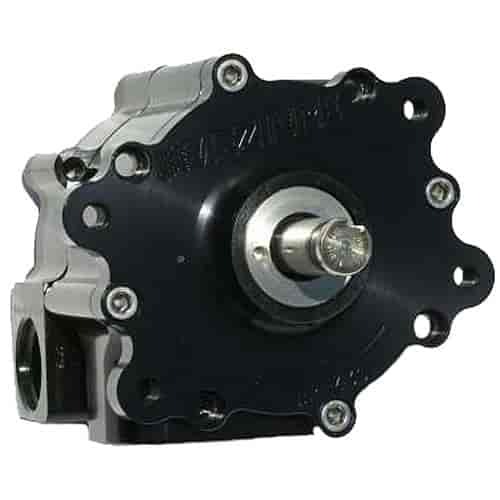 The appearance of this all billet belt driven pump is a definite show stopper, but the true beauty can be seen in the performance chart and on your temperature gauge. Top end figures match the best racing pumps on the market and off idle flow is 5 to 7 GPM higher than any competitor. This pump will save a racer over 10HP compared to a stock pump and eliminate most low speed cooling problems for the street rodder.